This fact-check explores what someone with five Vietnam deferments said about someone else with five Vietnam deferments. Trump and Blumenthal are the same age, 72. Both were born to privilege in New York City and attended Ivy League schools. Both managed to avoid the Vietnam War in the late ’60s and early ’70s. At other points before and during the 2010 race, Blumenthal accurately described his military record. “Although I did not serve in Vietnam, I have seen firsthand the effects of military action,” he said during a March 2010 debate for the Senate race, as the Times reported in the same article. Trump brings up Blumenthal’s lapses about Vietnam whenever the senator irks him. But the president’s latest comments go beyond the facts to a comical degree. This back-and-forth feels like the movie “Groundhog Day,” in which the same day keeps repeating itself. When Blumenthal told reporters that Justice Neil M. Gorsuch, then a Supreme Court nominee, had said in a private meeting with the senator that he found Trump’s attacks on the federal judiciary “disheartening” and “demoralizing,” Trump challenged Blumenthal’s credibility with a “Vietnam” tweet. When Blumenthal went on CNN to voice support for the investigation into Russia’s election interference and possible coordination with the Trump campaign, the president called him a “phony Vietnam con artist” on Twitter. Blumenthal sits on the Senate Judiciary Committee and has been critical of Trump’s embattled Supreme Court nominee, Judge Brett M. Kavanaugh. He has been saying lately that Kavanaugh gave testimony under oath that is contradicted by the facts. Blumenthal is also the lead plaintiff in a steadily advancing lawsuit that could open up the Trump Organization’s books to lawmakers. A federal judge ruled Sept. 28 that Blumenthal and nearly 200 other Democrats had legal standing in their lawsuit alleging that the president violates the Constitution’s emoluments clause when his business collects payments from foreign governments. That means the case can proceed even though Trump asked that it be dismissed. Blumenthal in 2003 told a crowd about “return[ing] from Vietnam,” implying he had been there, and in 2008 he told another crowd about “the days that I served in Vietnam.” He didn’t. A few days after the Times story, Blumenthal apologized for mischaracterizing his military record. This is false. Blumenthal never described himself as a war hero, never said he fought in Da Nang, and the Blumenthal remarks and news articles identified by the Times as false or misleading covered a nine-year period from 2000 to 2009, not 15 years. In some cases, the Times focused on news articles describing Blumenthal as a Vietnam War veteran and questioned why Blumenthal did not seek corrections. That’s different from saying he lied. The only problematic remarks from Blumenthal that we identified came in 2003 and 2008. We reviewed U.S. Senate election results in Connecticut from 1976 to 2016. Blumenthal won the 2010 race with a comfortable, 12-point margin. It was not “very close” or “probably the closest ever.” Sen. Joseph I. Lieberman won with a 10-point margin in 2006 and squeaked to victory with a 0.8-point margin in 1988. Sen. Lowell Weicker won with a four-point margin in 1982. Blumenthal won reelection in 2016 by 29 points. Several issues here: Trump appears to be referring to Blumenthal’s news conference the day after the Times article. Blumenthal did not apologize, get out of the race, or cry at this event, as anyone can see from the video. He apologized days later in a written statement, but written statements don’t have tear glands. “I obviously hit a nerve after the ruling in our Foreign Emoluments Clause lawsuit,” Blumenthal tweeted in response to Trump’s attacks. Blumenthal described his military record in misleading or false terms on a few occasions before he was elected to the Senate in 2010. He acknowledged as much when the Times called him out and apologized days later. He enlisted in the Marine Corps Reserve and served six years. Trump did not enlist and does not apologize when he makes false or misleading statements. His latest tirade against Blumenthal is littered with falsehoods that veer into ridiculous territory. In a 90-second span, Trump said Blumenthal claimed to have fought in Da Nang (false), that Blumenthal described himself as a “war hero” for 15 years (false), that he dropped out of the 2010 race (false), that he cried (false) and that he won with a close margin (false). 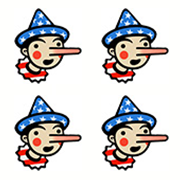 That’s five false claims, one for each deferment, but we can give only Four Pinocchios.